Assistant Professor (Lecturer) in Chinese Studies, Faculty of Social Science, UNNC. The canteen (shitang) is a part of everyday life in China that encapsulates the diverse transformations in the relationship between employment, society, and the state. It is an enduring familiar space that has flourished outside the dismantling of the state’s regulating organisation of society and work of the work unit (danwei) and commune. Within every school, university and large work place there will be a canteen serving a broad choice of different dishes. Outside of institutions, canteens are hugely popular and can be found next to every large housing, shopping, and business complex. The canteens were a key component of social and political life in China’s period of collectivisation. During the Great Leap Forward (1958-60) families relinquished cooking in their own homes for communal canteens run by the rural communes and urban work units. Grand ideas behind such collectivisation aimed to ensure all within the commune had a fair share of collective output by “eating from the same pot”. Propaganda posters for the move to collectivisation in the countryside promised that within the commune’s canteen people would be able to eat as much as they wanted. The reality, however, was somewhat different. Women and the elderly found themselves with less food due to the work points system which favoured men. The agricultural crisis following the policies of the Great Leap Forward saw food become scare and famine in many parts of the country. Eating as much as you wanted became a fantasy for most as millions died of starvation. After families were allowed to return to cooking in their homes canteens remained the heart of the state’s work unit (danwei). Work pressures, the distance from work to home, and food rationing meant that canteens continued to play an important part in everyday life. When the economy shifted from state to market, private entrepreneurs set up canteen-style restaurants to provide the same service to workers employed by all types of enterprises. People still sought the familiarity and convenience of the canteen even if their non-state small and medium employer did not have one. Busy families and those living in shared rooms and dorms without kitchens still needed a budget place to eat close to home or workplace. In present-day China, popular canteen chains proliferate, often offering higher quality food than the more basic fare to be found within institutions. Canteens are key sites of state institutions that have effectively became de-linked from the state and embraced by the market. Canteens offer a recognisable space. Eating in canteens is a familiar, habitual and sometimes necessary custom for many. The objects of the canteen and the established behaviour for selecting food provide no surprises for those growing up in China’s schools. The ubiquitousness of canteens in everyday life means that many Chinese people have little need to learn how to cook until well into adulthood. Accommodation within the Chinese education system does not ordinarily provide kitchens and when many move into employer-provided dormitories in their first jobs they still have no self-catering choice. For many living in urban China, most days will include a meal at a canteen. People become connected by the consumption habits even when unknown to each other. Amongst the gleaming office blocks and quiet commercial pedestrian streets of Ningbo’s Commercial Business District (CBD) lies a canteen-style restaurant whose rustic Mao-era interior is out of odds with its modern surroundings and exterior. At meal times, the canteen noisily fills with white collar workers staffing the area’s commercial and finance businesses. Uniformed service workers and fashionable office workers eat individually and in small groups, grabbing a tasty, quick, and cheap lunch amongst décor that looks to the Mao-era for its interior design. Simple wooden tables and stools evoke a collective past of the commune canteen. Added props include a mechanised mantle clock and vintage TV set decorate the walls. The canteen’s customers of the present day, however, have little relation to the period of collectivisation it evokes. Where the older generation may have felt bitterness for past hardships or nostalgia for the “golden period” of socialism and reminisces of their youth, the 80s generations have grown up in the reform era and understand that period as delinked history. The imagery of earlier decades is open for re-use and reinterpretation. 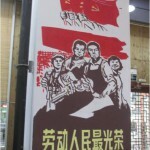 The canteen’s re-packing of the collective past as a site of capitalist consumption is connected to the Maoist chic generated through post-modern artistic uses of the Mao’s imagery juxtaposed with the symbols of capitalism and its subsequent mass production as “vintage” style products. Socialist-era imagery sells. Most striking in the canteen’s Mao-era design are two large socialist-realism style murals picturing strong and happy workers, soldiers, and peasants declaring that “labour is most glorious” and “knowledge is power” (Figure 1 and 2). The effect of the socialist content and its location within a profit-making restaurant serving the business district is not oppositional but rather produces mutually reinforcing meaning. “Labour is Most Glorious” is a slogan of the Mao-era which positioned labour as the esteemed social class. With China’s moves to reform and opening, the status and benefits of workers fell as social status shifted to the higher income entrepreneurs. Instead of reasserting the value of workers in Chinese society, the mural conversely reinforces the value of the office worker customers by reminding them that society has transformed, placing them in a social position above that of the peasants and blue collar workers. 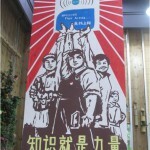 In the re-imagining of the “Knowledge is Power” mural, the workers now hold aloft a sign informing readers in English and Chinese that the canteen has wifi in the space which originally would have been a portrait of Chairman Mao. Mao understood power as coming “from the barrel of the gun” but this suggests that power now comes through education and technology. In the Maoist era intellectuals were de-valued and called one of the “stinking black classes” but now education is a pre-requisite for social status and access to white-collar jobs. Society’s vanguard is transformed to the tech literate, English-speaking, highly-educated worker. Mao-era imagery is no longer solely a form of nostalgia but re-deployed to produce new meanings in the contemporary commercial space so that the original meanings are lost and the social valuing of the present-day consolidated. Some contemporary canteen-chains describe themselves as Chinese-style fast-food. What makes them “Chinese” style, however, is not just the dishes are different from “Western” style fast food chains. The customary habits of the canteen were produced in the socialist era with China’s organisation of society around work. 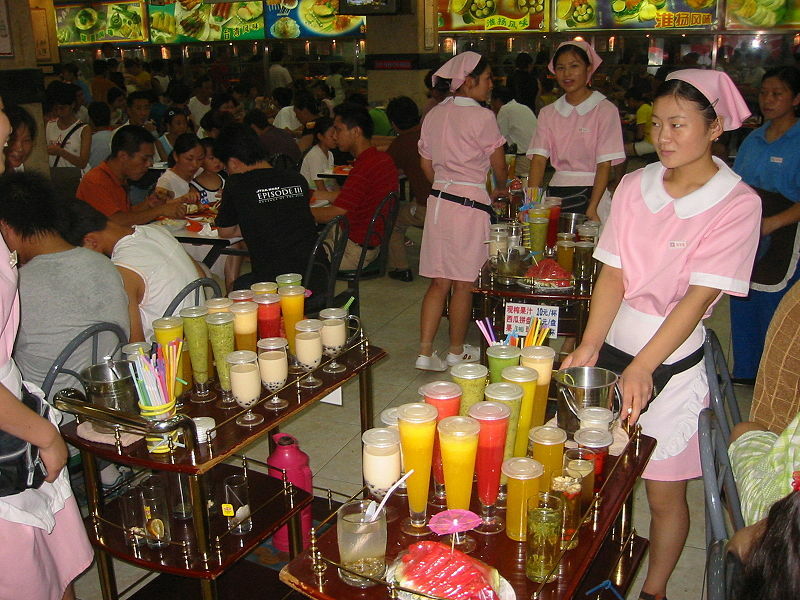 China’s canteens have changed but remain a constant in everyday life. Frank Dikötter’s (2010) Mao’s Great Famine recounts some stomach-churning and tragic canteen conditions. For example, across the medium sized city of Ningbo, chains such as Xin Si Fang (New Courtyard), Shun Wang Ji, Hao Wei Dang, and Lai Bi Bao (“Reboos Short Order”) have several stores. The quality of food within schools is often an issue of contention when the food is found to be sub-standard or prices inflated. The work of contemporary artist Wang Guangyi is known as one of the most influential examples of this. Does ‘Socialism with Chinese Characteristics’ suffice for Communism in contemporary China?